“Tinghir” where Muslim-Jewish coexistence flourished for many years. After the creation of Israel, Arab populations were overwhelmingly opposed to any appeasement with the state, especially in the context of the massive eviction of two thirds of the Palestinian population (a proper ethnic cleansing as stated by Israeli historian Illan Pappe). Many Arab Jews were also radically Anti-Zionist, such as the prominent political activist Henri Curiel. Curiel formed an important network to support the struggle of several liberation movements, including the Algerian FLN during the war of independence against the French. A recent documentary on Egyptian Jews mentions his unheeded warnings to Gamal Abdel-Nasser regarding the 1956 French-British-Israeli aggression. His murder in 1978 remains unresolved, though recent revelations suggest that he was the victim of a former French-Algeria nostalgic. Most Arab countries witnessed riots and unrest following the combination of the birth of Israel and the Nakba. These riots took place in a context of existing unrest, as most Arab countries were fighting for their independence. In Morocco, for instance, several riots targeted Jews after the 1948 events, but other riots and violent attacks also targeted French settlers during the same period. While there were several dimensions to violence in Arab countries at the time, these events were still frightening to many Arab Jews who started thinking of leaving their countries. Israel also deployed several means to either convince or simply push Arab Jews to emigration; the law of return was enacted partly for that sake. In Arab states, the Israeli Mossad deployed many operations, from financial arrangements, propaganda, to covert operations that included deliberate sabotage. In parallel, the rise of Arab nationalist discourse pushing for independence, and strongly opposed to any Western imperialist interference did not build an inclusive discourse for minorities (whether Jewish, Armenian, Greek, or others), despite the initial efforts of leaders such as Habib Bourguiba in Tunisia, or King Mohammed 5 in Morocco. 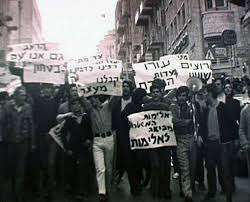 The growing tensions within Arab countries, during the independence struggle (as in Algeria), or against Israel (as in the 1956 Suez aggression by Israel, France, and the UK against Egypt) put Jews in an uncomfortable situation, sometimes used as scapegoats, and sometimes pressed to loudly proclaim their allegiance and loyalty. The distance between Jews and their compatriots grew larger and many started to leave, either towards Israel or Western countries. In Morocco, from 1948 until the country’s independence in 1956, Israel’s interest was not great and the French colonial authorities turned a blind eye. After the 1956 independence, King Mohamed 5 wanted to maintain Jewish presence in the country (he had taken several stands to protect Moroccan Jews against Vichy laws during WW2), and refused any type of cooperation with Israeli authorities; departures were then mostly clandestine. After his death in 1961, King Hassan 2 cooperated with the Mossad to push Moroccan Jews to expatriate, this was part of a large deal involving security arrangements, sales of weapons and exchange of intelligence labelled Operation Arche and confirmed by figures such as historian Yigal Bin-Nun. No expelling of Jews happened and many Moroccan Jews chose to go live in Canada and France, but the consequence is that the majority of the 300,000 Jews who lived in Morocco when the country became independent are now gone. In Egypt, there were episodes of riots and violence against Jews, but the Lavon affair showed that the Israeli secret services also deliberately conducted sabotage operations (and not only in Egypt) to scare people into leaving. The attitude of the Egyptian authorities was mostly repressive (in a context where Nasser and the free officers had just reached power and were eager to demonstrate a strong stance towards British imperialism, before the 1956 Suez aggression). Minorities such as Greeks, Armenians, or Jews were targeted and smeared as Trojan horses for imperialism and Zionism and gradually became scapegoats and targets of aggressive rhetoric. These stances scared Egyptian Jews who felt they would not be sufficiently protected, and convinced most of them that they would be better off leaving. In Iraq and Syria there had been episodes of violence during WW2, such as the horrible 1941 Baghdad pogrom (which happened in the context of a British intervention to topple the Iraqi government). In 1951, the Iraqi Government established a law that made the advocating of Zionism or belonging to a Zionist organization a crime and ordered the expulsion of Jews who refused to sign a statement of anti-Zionism, the implementation of such a law in an arbitrary dictatorial regime made it easy to target anyone and put Iraqi Jews under pressure. The combination of Mossad covert operations and incendiary nationalist discourse and violence (not only directed at Jews but also towards Shiites, Christians and other minorities) led most Jews to leave their country. Countries like Algeria and Tunisia saw most Jews choosing to go live in France. The effects of the growing social divide resulting from the Crémieux decree in Algeria, the atmosphere of the fratricidal independence warfare made the situation dangerous for any person assumed as linked to French colonialism. It also forced most Muslim “harki” collaborationists to flee the country (while several others were massacred after being abandoned by the French army). Overall, the Jews’ departure in both these countries is part of the general emigration that took place at independence and not really the result of specific Anti-Jewish campaigns. On the other hand, the 1963 Algerian nationality code stated that a pre-condition for citizenship was having Muslim paternal fathers and grandfathers; Jews had to undergo a special process to request citizenship. Such a measure was not only insulting for the many Jews who had fought for independence, it sent a signal to most Jews that they had little to no room in the future of the country and convinced them to emigrate. In Iran, while some emigration took place, many Jews still live there even after the 1979 revolution, they have the possibility to travel every year to visit their relatives in Israel, usually via. Turkey, with both Israeli and Iranian authorities choosing to turn a blind eye. These examples do not offer a comprehensive outlook of Jewish emigrations from Arab and Middle Eastern countries (the Wikipedia page on this topic offers good context) but they give some perspective. Unlike in Palestine in 1948, there never was any organized campaign to expel Arab Jews, the failure of Arab nationalists in particular and state leaders in general is that they didn’t convince them to stay and failed to give them confidence about their place in the new nations. The claims that Arab Jews were massively expelled has to be looked at as Israeli counter-propaganda to establish a moral equivalent with the fate of Palestinians in 1948. Still, the sad fact is that by the end the 1960s, the overwhelming majority of Arab Jews had left their country, either moving to Israel or to Western countries such as the USA, Canada and France. They were now separated from their Muslim compatriots, which meant a loss to most Arab countries, whose diversity was an immense source of cultural wealth, and whose national narrative had now shifted to a chauvinistic narrow discourse. On the other hand, Arab Jews did not receive a particularly great welcome in Israel, where they underwent significant discrimination by the Israeli authorities, mirroring a Western-Oriental divide between Israelis, where the establishment (symbolized by Askhenazi Europeans) discriminated against Arab-speaking immigrants. The discrimination they suffered is still a bad memory for many “Oriental Jews” who created protest movements such as the Israeli Black Panthers and have overwhelmingly voted against the Labor party since. Wounds have begun to heal with the increasing integration of Arab Jews into Israeli society. The 1967 war and the crushing of Arab armies by the Israeli offensive went one stage further in widening the gap and the nature of the conflict. On the Israeli side, it gave a morale boost to the religious right and helped them pressure the government to allow and fund massive settlement building in the occupied territories, thus increasing their political importance in the Israeli social-political landscape. On the Arab side, the 1967 defeat was a massive blow to the Arab nationalist movement, which had many flaws, was authoritarian, but was still trying to build some form of Arab autonomy while trying to provide room for minorities. The defeat gave way to the rise of Muslim conservative and fundamentalist movements, whose discourse provided little to no room for minorities, especially Jews. In both cases, the results were disastrous for whoever favored coexistence. Beside the increased divide, there was also the emergence of Anti-Semitism, often borrowed from Western Anti-Semitism. This discourse is punctuated by invitations and publicity for: holocaust deniers such as Roger Garaudy and Robert Faurrisson in Lebanon and Iran, successful sales of purely Anti-Semitic propaganda such as the Protocols of the Elders of Zion or even Mein Kampf in Lebanon and Egypt, conspiracy theories about 9/11 being a Jewish plot, several shameful talk shows or TV series such as the Egyptian “Horseless rider” (the plot stars a virtual horseman who slays the “Zionist dragon” and denounces a “Jewish conspiracy against Palestine” inspired by the Protocols of the Elders of Zion). In Western societies there has also been a limited but real rise in Anti-Semitism among some Muslim communities. In the UK, it was acknowledged and condemned by Mehdi Hasan, and this tendency also exists in other European countries, as shown in the recent violent events in Sarcelles, following summer protests against the war on Gaza, the kosher market attack in Paris, or the attack on a synagogue in Copenhagen. The scale of these events is subject to manipulation (Islamophobes tend to exaggerate their scale while a tendency for denial exists on the other end of the spectrum), but in any case they represent a very worrisome trend and regression. The increase in Anti-Semitism should be fought and condemned, as it was by prominent critics of Israeli policies, such as Lebanese writer Elias Khoury, or Beirut based reporter Robert Fisk, and the late Edward Said, whose words remain as relevant as ever. Why do we expect the world to believe our sufferings as Arabs if we cannot recognize the sufferings of others, even of our oppressors, and we cannot deal with facts that trouble simplistic ideas of the sort propagated by bien-pensants intellectuals who refuse to see the relationship between the holocaust and Israel. Again, let me repeat that I cannot accept the idea that the holocaust excuses Zionism for what it has done to Palestinians: far from it. I say exactly the opposite, that by recognizing the holocaust for the genocidal madness that it was, we can then demand from Israelis and Jews the right to link the holocaust to Zionist injustices towards the Palestinian, link and criticise the link for its hypocrisy and flawed moral logic. But to support the efforts of Roger Garaudy and his holocaust-denying friends in the name of “freedom of opinion” is a silly ruse that discredits us more than we already are discredited in the world’s eyes for our incompetence, our failure to fight a decent battle, our radical misunderstanding of history and the world we live in. Why don’t we fight harder for freedom of opinions in our own societies, a freedom, no one needs to be told, that scarcely exists? When I mentioned the holocaust in an article I wrote last November, I received more stupid vilification than I ever thought possible; one famous intellectual even accused me of trying to gain a certificate of good behaviour from the Zionist lobby. Of course, I support Garaudy’s right to say what he pleases and I oppose the wretched loi Gayssot under which he was prosecuted and condemned). But I also think that what he says is trivial and irresponsible, and when we endorse it, it allies us necessarily with Le Pen and all the retrograde right-wing fascist elements in French society. No, our battle is for democracy and equal rights, for a secular commonwealth or state in which all the members are equal citizens, in which the concept underlying our goal is a secular notion of citizenship and belonging, not some mythological essence or an idea that derives its authority from the remote past, whether that past is Christian, Jewish or Muslim. As I said, the genius of Arab civilization at its height in, say, Andalusia was its multicultural, multi-religious and multi-ethnic diversity. That is the ideal that should be moving our efforts now, in the wake of an embalmed, and dead Oslo, and an equally dead rejectionism. The letter killeth, but the spirit giveth life, as the Bible says. Loonwatch has done thorough work debunking these Islamophobic campaigns, there is no need to list them. Nevertheless, the striking aspect is how organizations with different agendas and objectives, such as US and European pro-Israeli support groups, neoconservative intellectuals, European extreme right wing parties, and some personalities coming from the left wing all stand side by side on an ideological anti-Muslim crusade. Historically, the horrors of the holocaust have positioned many Jewish intellectuals and political organizations at the forefront of Anti-racist and other universal struggles (such as the protection of Bosnian Muslims during the horrific ethnic cleansing and massacres in the 1990s). This history makes it sad to notice that several Jewish mainstream organizations (such as the French CRIF) have either kept silent if not actually supported Islamophobic campaigns. In 2002, after Jean Marie Le Pen reached the second round of the French presidential election, the president of the CRIF (representative body for Jewish organizations in France) declared that this was a signal for Muslims to keep quiet, completely forgetting about the Anti-Semitic dimension of Le Pen’s party. In perspective, mirroring Anti-Semitic regression among Muslims, a regressive Islamophobic trend has also emerged among Jews, as many prominent intellectuals and organizations are so blinded by their unconditional support for any Israeli policy that they openly befriend populist parties that have a heavy Anti-Semitic past. One illustrative example of this paradox is when Israeli foreign minister Avigdor Lieberman received a delegation of extreme right wing parties in 2010, including personalities such as Geert Wilders, Belgian Philippe Dewinter, Swedish Kent Ekeroth, or representatives from the Danish people’s party. It remains the case that contemporary politics in Israel and the Arab world are dominated by movements that are either not interested in promoting multi-faith coexistence (if they are not actively fighting it). This is the case for most Arab regimes, and both nationalist and Muslim conservative movements. The outlook is similarly ugly for the Zionist spectrum, now strongly leaning to the right (if not the extreme right), where racist discourse has become mainstream. Discourse in favor of coexistence with the Israeli Arab minority and Palestinians in the occupied territories is largely only promoted by what is termed the “extreme left wing” and some prominent figures such as former Knesset chairman Avraham Burg, veteran peace activist Uri Avnery, journalists such as Amira Hass or Gideon Levy, and other pacifists. For Muslims and Jews who had coexisted for years, the resulting situation and tensions we see today are purely depressing; this leaves the question of what to do. As shown above, separation between Muslims and Jews in the Muslim world is now a fact and will be difficult to reverse. The wounds of the Israeli/Palestinian conflict and the post-9/11 atmosphere has created suspicion and distance. The relationship is not completely broken but a lot of work has to be done in order to fix things. As explained in the introduction of this article series, my view of history is driven by my personal background and my family’s positive experiences. Obviously, my narrative is quite subjective. I am sure that many people will disagree, either with the overall perspective, or with some specific details, what I hope most people will agree with me is about the urgency of inventing new forms of coexistence. While Jewish/Muslim relations are not monolithic, and are driven by local considerations, many points need to be highlighted. First of all, coexistence should be reinvented, the terms of coexistence that existed a few centuries ago are not applicable to the modern world; Jews and Muslims both expect equality. 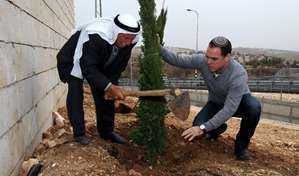 Coexistence will happen in different places from the past, while it existed mostly in Arab and Muslim lands before, it is now more likely to happen in Western countries and in Israel/Palestine, as these are the places where significant Jewish/Muslim communities tend to live side by side (for instance in France, the United States, Israel/Palestine, the United Kingdom or Netherlands). Building a new model of coexistence also goes hand in hand with a common fight against bigotry. Jewish and Muslim anti-racist organizations should help each other more when Anti-Semitism or Islamophobia emerges, this already occurs, but it has to happen systematically. The sight of Jews supporting Islamophobia or Muslims supporting Anti-Semitism is a pure disgrace and at odds with history, this has to be fought fiercely. Common Jewish/Muslim initiatives, whether involving history seminars, arts, sports, or any concrete project should be encouraged, people (especially the youth) should be given more opportunities to meet and talk. Bigotry and hostility towards others are less likely when they have a face, a name, and when they can be related to with an anecdote or joke. Creating sustainable relations between people is what helps solve problems. Most of all, no long term solution can be considered if it does not include a fair and sustainable solution to the Israeli/Palestinian conflict, a solution that addresses the plight and suffering of the Palestinians, whether the ones in the occupied territories, in Israel, or the refugees, and addresses their political rights to self-determination and independence. Such solutions should also provide assurance to Jews that they can live safely and in peace with their neighbors. Arab Jews who want to live in Arab countries should also be given the opportunity to do so. Whether a solution involves a single state or a two-state solution is a different matter (the prospect of a two-state solution is more unlikely than ever). Despite the legitimate criticism that can be made of Palestinian organizations such as Hamas, the Israeli government’s attitude, its unrestrained usage of violence and its settlement policy are the main hurdles. The recent horror of the Gaza massacre shows that this is not an even fight, just as peace was achieved in South Africa by addressing the suffering of the victims of apartheid, the focus should be about protecting the Palestinians and guaranteeing their rights. If this doesn’t change, no good can be expected, and things will keep going downhill for Jewish-Muslim relationships. … Something like this is now happening to the Revisionists themselves. They ask for three things: a Jewish State, a state that encompasses all of historic Palestine and a democratic state. That is too much even for God. So a Revisionist must choose two of the three: a Jewish and democratic state in only a part of the country, a Jewish state in all the country that will not be democratic, or a democratic state in all the country that will not be Jewish. This dilemma has not changed over the last 41 years. 6 years later, the dilemma is still as relevant as ever, but the first option (a Jewish and democratic state in one part of the country) which would guarantee two states is less likely, the points raised by Avnery still require an answer and cannot be evaded any longer. Beside the Israeli-Palestinian front, more effort should be put on teaching common Jewish/Muslim history. In his book “Defeating Hitler”, former Knesset chairman Avraham Burg had suggested the Israeli education system to focus more on positive experiences such as Andalusia, to show children that Jewish history is not only made of tragedies. Similarly, in Muslim countries, especially the ones that have a strong Jewish history, children should learn more about the multi-faith and multi-cultural dimension of their past. This does not mean that the negative moments and periods (explained above) should be evaded, quite the contrary, tensions begin and grow in the shadows when such topics are avoided. These suggestions may sound naïve and insufficient to some, especially in light of the never ending tragedy unfolding in the holy land, but they are a positive, practical first step; it would be unforgivable not to try . To conclude this overview, I would like to come back to two people who symbolize better than anyone else the profound sense of coexistence and tolerance. The first person is named Yacout and appears in Kamal Hachkar’s movie “Tinghir Jerusalem” mentioned in the beginning of this article. This Jewish Amazigh lady was born in Kelaat Mgouna in south east of Morocco and grew in Casablanca, dressed like any Moroccan woman, she emigrated to Israel and made an unplanned but magnificent appearance in the movie. Speaking with emotion about her fond memories of her childhood in Morocco (sending virtual kisses whenever mentioning Muslims) and how well she remembers her Muslim neighbors (apologies, video is in Arabic/Hebrew with French subtitles), and simply expresses her despair about why land is subject to such hatred. The second person is called Lahcen, a Moroccan Muslim Berber not far away from Tarudant in the south, who, in the 1950s made a promise to his Jewish friend, Moshe, on the point of emigrating to Israel. 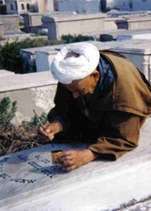 From then on, he would look after Moshe’s family’s graves, regularly buying paint to maintain Jewish scriptures and made a point of sticking to his promise. These two wonderful people unfortunately passed away in 2014, they are anonymous people who witnessed the devastating effects that history can have on people’s lives. They weren’t prominent intellectuals or scholars who could speak at length about history, but they both had their own simple words, and humble way of practicing tolerance and the best of what our civilizations have produced. Now that this generation is slowly leaving the stage, the challenge we face is to keep their message alive and reinvent it in the context of our time. In other words, the challenge is to renew and reinvent peace/shalom/salam. Most of your points are accurate but I think that there is little to demonstrate massive popularity of fascism, it’s mostly anti-colonialism, and in many cases it didn’t lead to real collaboration. Comparatively, Ukrain provided much more support for instance to SS units or to nazis as a whole, or take south east Asia and how the Japanese were originally received. But in the end, very interesting argument. And btw, even if I’m proud of Moroccan troops’ achievements during WW2 (one of my best childhood memories was hearing a Moroccan veteran telling me his WW2 memories while fishing in the south), Algerians also deserve also credit for their achievements there. Another story, Mbarek El Bekkay, Morocco’s first post-independence prime minister lost his leg fighting german troops in France in 1940 and spent several months as a war prisoner. There are so many such stories. You make a lot of points, some I agree with and some less, but your views are well articulated. I just want to respond on nazi propaganda and Hussaini. There is no denying that there were some Arab nationalists who were attracted by fascism and even considered allying with the nazis during WW2, that has to be looked at from 2 angles: 1) This tendency was universal and not specific to the Arab world then, whether in Western or Eastern Europe, South East Asia, Latin America, etc. Fascim was a strong political current and was also seen as an alternative in colonized nations through the wrong but usual discourse of “My enemy’s enemy is my friend”. In general that was as far as it went for most Arab nationalists, they just considered allying or discussing with the Germans (as several Asians did the same with the Japanese only to realize they were no better). In some sense, even a Zionist movement such as Lehi considered discussing with the nazis: http://en.wikipedia.org/wiki/Lehi_%28group%29 2) In general, the overwhelming majority of Arab movements were on the side of the allies by a huge margin. I will come back below to Husseini but the only Muslim pro-nazi units he built up operated in Yugoslavia and were involved in local fighting, their impact was marginal, comparatively, north African fighters provided a massive figthing force for the French and played a key role in Italy (especially the Monte Cassino battle), during the liberation of southern France or when crossing the Rhine. The only country where there was a strong political movement leaning towards nazism was Iraq and that didn’t last long during WW2. Al Hussaini is a good example but his role is much more a contemporary tool used to establish some form of Arab involvement in the holocaust than a leader with a key role. What did he accomplish during WW2? His role was minor during the 1936-39 intifada, he seeked support form Hitler, who used him for propaganda reasons, but apart from creating some SS units in Yugoslavia, he had no active role nor any results to claim credit for, he was a minor pathetic opportunistic self-proclaimed leader and is being given a strong role, mostly for pro-israeli contemporary political purposes. As Gilbert Achcar points out “the entry on the mufti in the Encyclopedia of the Holocaust, published in association with Yad Vashem (the Holocaust remembrance authority), is much longer than those on Himmler, Goebbels or Eichmann, and only a little shorter than that on Hitler”. Yes, longer than Himmler, Goebbels, or Eichmann… More details here: http://mondediplo.com/2010/05/14blamethemufti Thanks for your comment, lots of interesting points in any case. Nurse ! Nurse! He is off his meds again come quickly . Of course I knew it was a joke. As for what is right or wrong, does it really matter if madeeh or madih? In the end it’s just a transcription from Arabic.. In morocco we tend to say mad’h. You sound like taking my silly joke about paying me rewards seriously. I do hope that I am wrong in this assumption. Which is more correct Madih or Madeeh ? and Tafsir or Tafseer ? I really do not know. Will appreciate your help. . I wonder which is more correct to write the word ” Madih ” in English, as you have used it as ” Madih ” or as Madeeh ” ? The same question about the word ” Tafsir ” or ” Tafseer ” ? Which is more correct? Madih or Madeeh reminds me of what Abu-Altaiyeb Al-Mutanabi, one of the greatest Arab poets, had done in poetry to Kafour, the ruler who once ruled Egypt: when he has good relationship with Kafour, he made great Madih or Madeeh about Kafour. But when his relationship with Kafour had deteriorated he made great poetry, but really horrible ” Higa’a,” meaning: ” Condemnation ” in a real nasty manner I refrain from translating it in public. Moreover, some of the poets, in Baghdad during the Abbaside’s splendid era, used to make Madih or Madeeh to the rulers for rewards in Dinars. Well, I have made Madih to you free of any obligation for rewards–Just joking, Mehdi.